The bible of American button identification. 800+ pages. Reprinted in 1991 and again in 1993 but hard to find, like many definitive collectables books. Copiously illustrated in colour and black and white throughout. Hard to tell whether button collecting is waxing or waning. Seems to be reasonably strong with much interest on ebay in the vintage sewing section and a few major button dealers and even a promised news sheet called 'The Daily Button'. Doesn't seem to need a jacket. Presented for auction is this MUST HAVE book for anyone who collects buttons. This book is in great shape and has hardly been opened. 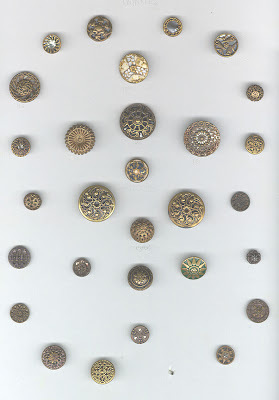 FILLED with lots of photos of buttons and descriptions and history of the various types of buttons. This book is due to go for reprint sometime in 2008 with up-to-date button values, but the retail price will be around $500. This is your chance to own this book at a more realistic price. This would also be a great gift for the collector or enthusiast. Why not place your bid now? Possibly button collecting is a cut throat world, full of collectors who would betray a lifetime's friendship for the chance of a rare bakelite fancy. Not unlike the bookplate world. 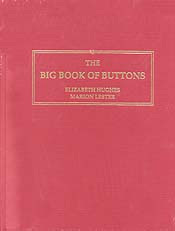 The Big Book of Buttons is being reprinted and due to come out towards the end of 2008. It is to be in TWO hardcover volumes, and is said to be priced at approx. $300, according to a trusted source //(*_~)\\ So in my humble opinion, it makes no sense to purchase the old single outdated book for the same price you will be able to pay to get the same info, updated and corrected, with better photos. It's July 2009, and we, who have paid our deposit years ago still have no idea when this book will be published. With the thousands of collectors who paid a $20.00 deposit each 2 years ago or longer, why should they be in a hurry? The interest they are collecting on our deposits will probably pay for the printing Also,the book which started out to cost $250.00 to $300.oo is now $395.00 + s/h and the price goes up every time we hear from them. I get updates and I'm a member of the National Button Society, several excuses have been sent to us, but the fact is, the more excuses, the more interset is drawn on who knows how much money. NOW, that's a fact! I never paid a depost.. decided that the $20.00 you save by pre-ordering wasn't worth it. I am very VERY disappointed that there is no word on when it will be available. They keep saying "first quarter 2008, last quarter 2008, middle of 2009" and now here it is almost going into 2010. Sounds like a scam to me!!! I too was wondering about when this was going to happen and am happy to report that I just received an email from the people that are taking the $20.00 deposit for the new Big Book of Buttons and they are reporting that it is almost ready for printing. I am wanting to believe them as I have not paid any deposit and have nothing to lose and they still sent me the email. Hope that helps and I am excited as you all are to finally be getting somewhere with this. Can someone tell me the name of the people taking the deposits and where I could contact them? I have been waiting to buy this book... Thanks!